UFCJohny wrote "tell the world !!!!!" Thanks for your appreciation. I wish you a Happy New Year. Thanks for the game in the Clubclash. Thank you for your message, we enjoyed our clash with you all and look forward to many more close matches. 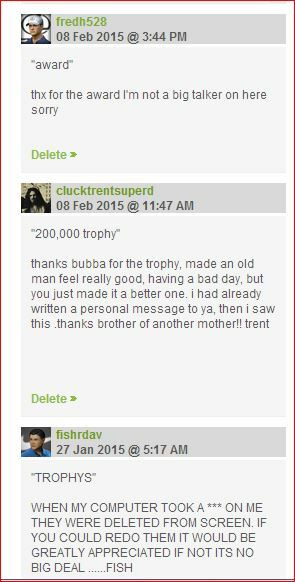 likesmallbutts wrote "Thank you "
azdewars wrote "I Don't Thank You Enough"
I'm truly sadden by what life has handed you and family. You know that you and family are in my prayers. You have weathered through difficult times with the VOTSCC and your determination and fortitude will get you through this misfortune. You have shown your worthiness time and time again. I'm here for you my friend if the need arises. A BIG thank you for ALL the time, work and dedication you have exhibited since my recruitment into the VOTSCC. BTW: I could use a road trip. Real sorry to hear of the issues you're going through. You've been a great asset to the Community ! Thanx pdb1, close to the very finish. All the best for the rest of the clash. Thank you for the response to my post in the Forum. Also, thank you for the invitation to join your club. But, I am looking for a lower level club that need some help to advance. Your club is very well established and a credit to WGT as a playing club with outstanding members. Thank you again for the invitation and my best wishes for your clubs continued success. I just saw your post on my wall as I play more mobile today. Sorry to see you’re about to go under the knife for both shoulders. I’ve had friends go for shoulder replacement vs. corrective surgery. These are rough recoveries but I pray you push through with flying colors. Hope to see you back swinging them soon! I'm really getting hammered in the forums! Not sure why I am being targetted right now. JimQ916 wrote "WTG Boss Man!!!!!" jonny88 wrote "terrible with names"
So glad your back. I posted you PB1 forgot the D. Saw your post to DC. I hope your better now. Love reading your shots in the Forum. Take Care!!! Wood4Woody wrote "Sorry for late reply"
Only just got round to checking profile page and read your comment on my wall regards CC67. Many Many thanks from Dawn and myself. As a new club - I only started it after CC64 - with only 2 players, at the moment most of our time is spent racking up the club xp, with the Clashes coming as a nice break in the tedium. 3 events under our belt and currently sitting 288, a few more players and we could be a good challenge later on. Hope to meet again in next clash. Take care and may the Great God " Holey Putt - Putt " bear riches down on you and your fellow players. Oh yeah, have sent you friend invite, I hope you will accept it and we can meet out on the greens. Paul. I read your comments on Robert1893 Wall. I am truly sorry to hear what you are going through. I am sorry for whining the other day about my whoa's when they are so in-significant compared to issues others have. I am embarrassed now. Paul, if you ever need to talk, don't hesitate - I will be here for you. I know you likely don't think much of me, although you have always been fair to me (ME - THE TROLL, as some other people call me). However, I am a retired cop after 35 years in service. I am a good person. As far as you are concerned, I have always thought highly of you as does pretty much everyone else you come into contact with. Keep plugging away, and I know things will get better for you. Thank you for being YOU. HenryKawa wrote "WOW HENRY GETTING BLASTED IN THE FORUMS!" - Hello Sir. I don't see you in the forums very often. I am getting "HAMMERED" right now by so many people in a thread called "WGT History and Milestones!" - All the nasty things ppl say about me is "water off a ducks back". The only thing that bugs me is when they call me a liar about being a retired cop. I spent over 35 years in the profession and it is one of the few things I've ever done that I'm proud of. Other than raising a wonderful family and my grand kids. - Talk to you soon, my friend. Hey Paul, sorry if I got you in trouble with icon. But I felt he might be our only hope with getting any type of answers from WGT. But I also realize he's merely a pawn. His hands are tied just like Members Services. It's just unfortunate that WGT is so damn pig-headed and doesn't let us know what their intentions are going to be once Flash is gone bye-bye. There are so many players who have gotten fed up and left the game it isn't even funny!! I hope you're not upset with me Paul. I was only trying to keep the conversation going. Thanks Paul for the CC offer. One of my friends added me to their CC. First, thanks for the post. We at UFVG enjoyed our clash round also. I am posting this to see if your club would be interested in a CC vs CC Challenge Match for the Month of April, or sooner. Post yer reply or send me a friend invite so we can work out the details. We have a team of 12 players ... 2 are Master tiers, 7 Legends,1 Tour Legend and 2 Champion (small club). So, if your club can match that (or something close) it would be great. I propose 2 rounds ... one Stroke Play and one Match Play. Two weeks per round, to allow opponents time to schedule and complete the rounds. Thanks for the heads up. He's all yours. Be well. mitimiti51 wrote "Looking for a club to join"
Hi the club I belong to currently is not very active. I like the look of yours. Hi pdb. Thanks for the response. Yes I’m interested in joining your CC. I’m a new player and would like to be part of a learning community and find some decent folks to compete with and against. Still finding my feet in the game! BobbyWiser wrote "We Like, and Love,and We Pray"
AlaskanDame wrote "Hope you are getting better, Paul." And I see one of my new members used to be yours (faasda1). But he was unattached when he requested FAPC membership, so I hope that's okay with you. Thanks for you kind words, I hope we can meet in another clash soon. eisaku10 wrote "Hello PDB 1"
You and your team are wonderful, please continue to succeed, thank you. ironhawk0 wrote "We will meet again"
Thank you gentleman from the fairway crashers on two good clashes . Thanks very much for the warm welcome! bossbird wrote "Just to let you know "
I have no idea what you're talking about. What about my owner? Thanks PDB1, on behalf of CLUB 801 congratulations on your top 100 finish. "Come on now, just sthu..."
So you bilked WGTer's out of a pile of cash. Have sense enough to thank them and move on. No one in the WGT world is going to buy into your lame, little Martyr act. Stop hijacking threads and acting like you know everything, because you don't. It's really gotten old, and fast. Especially when you babble on about the clashes, and any tech support issues. SMH, you're making me ill.
thanks friend, always a pleasure to play with people with great sportsmanship and lover of this great game. Thank you very much. Always our pleasure to play against yours. I found a person with a wi fi hotspot on their phone . To allow me to write this final message . Even if I could still play . Even if there was a chance I could return some day in the future . I will not . Need I say more about why I left?? I did enjoy all the effort you put into the CC, Paul, but maybe if you would have put more effort into IRL,,,,,,,You would be happier. As have many before you . With out the proper knowledge of the truth . You would jump to a conclusion that an old date on a blog was connectewd to a new post . The blogs do not update when you edit or add to them . If you insist on thinking that in any way . I have ever been dishonest or deceitful . I have not . Never needed to be . The factual truth is all I swill ever need . Have always been completely honest and gracious with you . Have enjoyed meeting you and was sorry to see you go . Please refrain yourself from posting false accusations on these WGT pages . Please try to open yourself to the truth . May the SUN always be with you . "I ask you to "
Please remove that ridiculous statement from my wall . If you follow this post, you would have noticed that Casey declined the offer to be nominated as one of August recipients for all his effort spent to organize this event. Modest and humble are a few of his finer qualities. However, as an individual that believes that “Good Deeds” should not go unrewarded. On August 15, 2018, I’m asking all the 1st year recipients send Casey a sleeve of Taylor Made TP 5X level 48 balls. Cost- 400 credits. If you don’t have credits to spare, don’t stress, it’s just a thought. But please send him a PM and thanking him for all he, the Bushwhackers, and friends have done for our community. As I said this is just a thought. I never dreamed that I would one day be wishing for a bridge collapse. lexmarkz33 wrote "The Smart Caddie is ready"
Right now only people who have excel can use it. I am trying to find a web app to convert it. Do you have excel? Charles1553N wrote "Merry Christmas "
Both of us would like to wish you and Karen a blessed Christmas and a fruitful new year. Thank you Paul...Hoping you and your family have a great holiday. 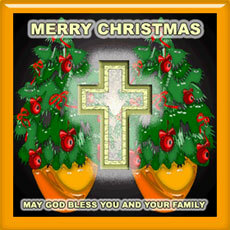 Chris1973M wrote "Merry Christmas and Happy New Year"
I hope you and Karen have a great Holiday!! Safe travels my ole friend. Hola Paul and Karen, We wish you both a VERY MERRY CHRISTMAS and a HAPPY AND PROSPEROUS NEW YEAR Gordon and Pat. Merry Christmas Paul ! Hope all is well my Brother ! Gimme a call ! God Bless and Prayers sent ! Mca19670 wrote "HIV A BRAW XMAS & AWE RA BEST IN THE NEW YEAR BOSSMAN." Merry Christmas and Happy New Years to you and your family. God bless. Hey Paul hope ur doing good Merry xmas to you and yours Mike.